The EIP-MTC series swimming pool heat pumps is highly effective and efficient. The range is equipped with titanium condensers that are suitable for both sea-, salt- and fresh-water pools. The EIP-MTC series is equipped with automatically controlled expansion valves that increase efficiency in varying climatic conditions. These units also have the functionality of an automatic defrosting cycle which is excellent for self-protection during colder periods of the year. 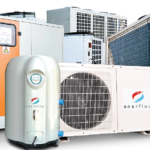 The Enerflow EIP-MTC series were developed for 400V/3-phase/50Hz applications, with heating capacities ranging between 50kW and 150kW.